To view 6 more pictures, interactive maps and the full, detailed description of the Rose Garden Estates community, please Login. The real estate for sale in Rose Gardens Estates is next to a conservation area. New homes here allow homebuyers to feel the serenity that comes with living in the backwoods, yet live close enough to the metro area to quickly access city amenities. Located right around New Mill Creek in Chesapeake, VA, this development affords easy commutes to Chesapeake General Hospital and military bases like Norfolk Naval Shipyard, the Coast Guard Finance Center and Naval Medical Center Portsmouth. In this land of real estate for sale, homes are divided into two categories. The first choice for homebuyers here is carriage homes. These new homes are actually twin style condos, which require low upkeep. A carriage home in Rose Gardens Estates may include up to four bedrooms, one-car garage, front porch, loft, walk-in closet, media room, brushed chrome door hardware, granite countertops, tray ceilings, Frigidaire stainless steel appliances and more. The next option in real estate for sale here is estate homes. 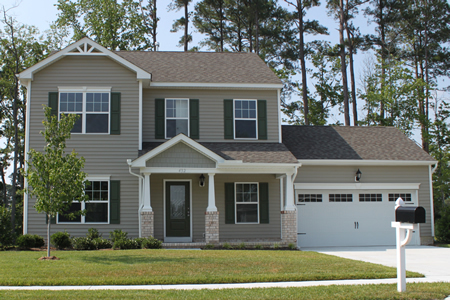 These single-family new homes feature several models to choose from and each comes on an individual lot. An estate home in Rose Gardens Estates may come with two-car garage, up to four bedrooms, up to three bathrooms, study, bonus room, hardwood flooring, crown molding, chair rail, ceiling fans with lights, ceramic tile surround with garden tub, front porch with columns, landscaping and more. Chesapeake is an area of Virginia that attracts couples, families and single professionals for its relaxed city vibe. Residents can take advantage of the land surrounding the development for quiet retreats with the sounds of nature to guide them. Give golfing a try at Cahoon Plantation or Elizabeth Manor Country Club. Store those boats at Top Rack Marina to get back in the water quickly. Searching through real estate for sale in Hampton Roads can often feel like looking for a needle in a haystack. Discouragement disappears when homebuyers land in Rose Gardens Estates. These new homes can cure the doldrums and put that pep back in those steps. Send me more information about the Rose Garden Estates new home community. Our agents gladly offer FREE property tours of Rose Garden Estates, Chesapeake and homebuyer consultations to all serious buyers.